Q. Is Dr. Chen employed by Costco? No, Dr. Chen leases space from Costco and operates his office independently. Q. I don't have a Costco membership; can I still get an eye exam at Costco? Definitely! 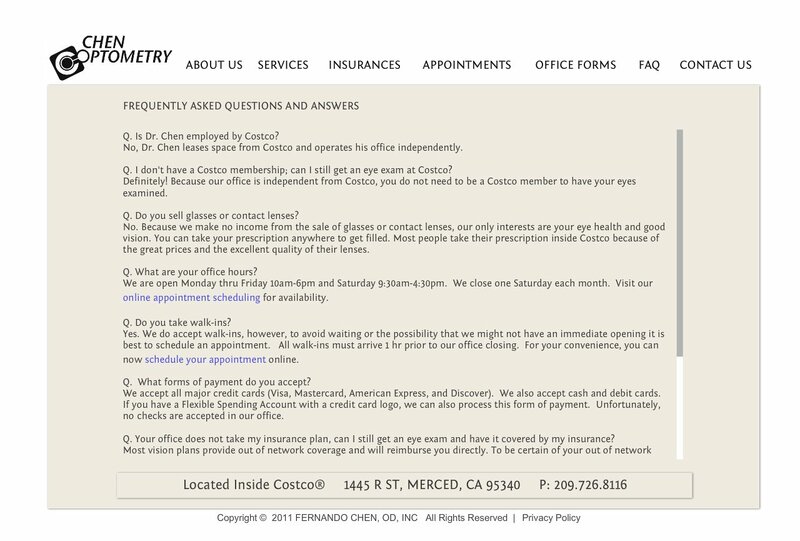 Because our office is independent from Costco, you do not need to be a Costco member to have your eyes examined. Q. Do you sell glasses or contact lenses? No. Because we make no income from the sale of glasses or contact lenses, our only interests are your eye health and good vision. You can take your prescription anywhere to get filled. Most people take their prescription inside Costco because of the great prices and the excellent quality of their lenses. We are open Monday thru Friday 10am-6pm and Saturday 9:30am-4:30pm. We close one Saturday each month. Visit our online appointment scheduling for availability. Yes. We do accept walk-ins, however, to avoid waiting or the possibility that we might not have an immediate opening it is best to schedule an appointment. All walk-ins must arrive 1 hr prior to our office closing. For your convenience, you can now schedule your appointment online. We accept all major credit cards (Visa, Mastercard, American Express, and Discover). We also accept cash and debit cards. If you have a Flexible Spending Account with a credit card logo, we can also process this form of payment. Unfortunately, no checks are accepted in our office. Q. Your office does not take my insurance plan, can I still get an eye exam and have it covered by my insurance? Most vision plans provide out of network coverage and will reimburse you directly. To be certain of your out of network benefit contact your insurance company. We will help prepare reimbursement paperwork for you at no charge. Q. Do you test for glaucoma, cataracts, and macular degeneration? Yes. Early detection of these diseases is very important. We test for these conditions during all annual eye examinations. Q. I had an eye exam a little over a year ago and I seem to see fine, why do I need to have another eye examination? Annual eye examinations are recommended for patients of all ages, even those who do not wear glasses. Your vision can easily change over a years time. This change often goes unnoticed as you learn to adapt to the gradual shift. Also, many eye diseases (such as glaucoma, macular degeneration, and cataracts) do not affect your sight in the beginning stages. Early intervention is vital to preserve your vision and eye health. Q. What types of contact lenses do you fit? We fit all contact lenses on the market: astigmatism (toric), bifocal, gas permeable.